United States Walkie Talkie Market by Manufacturers, States, Type and Application, Forecast to 2023 | Market Research Reports® Inc.
United States Walkie Talkie Market by Manufacturers, States, Type and Application, Forecast to 2023 report is published on June 5, 2018 and has 108 pages in it. This market research report provides information about Handsets & Devices, Country Overview (Telecom), Telecom industry. It covers USA regional market data and forecasts. It is priced starting at USD 4,480.00 for Single User License (PDF) which allows one person to use this report. 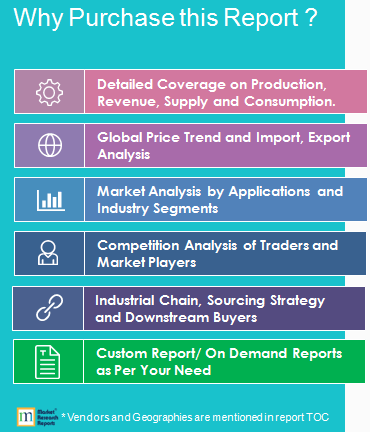 This report focuses on the Walkie Talkie in United States market, to split the market based on manufacturers, states, type and application. There are 17 Chapters to deeply display the United States Walkie Talkie market. Chapter 16 and 17, to describe Walkie Talkie Research Findings and Conclusion, Appendix, methodology and data source. In this report, we analyze the Interactive Tables industry from two aspects. One part is about its production and the other part is about its consumption. In terms of its production, we analyze the production, revenue, gross margin of its main manufacturers and the unit price that they offer in different regions from 2014 to 2019. In terms of its consumption, we analyze the consumption volume, consumption value, sale price, import and export in different regions from 2014 to 2019. We also make a prediction of its production and consumption in coming 2019-2024. At the same time, we classify different Interactive Tables based on their definitions. Upstream raw materials, equipment and downstream consumers analysis is also carried out. What is more, the Interactive Tables industry development trends and marketing channels are analyzed. In this report, we analyze the Mobile Phone Connector industry from two aspects. One part is about its production and the other part is about its consumption. In terms of its production, we analyze the production, revenue, gross margin of its main manufacturers and the unit price that they offer in different regions from 2014 to 2019. In terms of its consumption, we analyze the consumption volume, consumption value, sale price, import and export in different regions from 2014 to 2019. We also make a prediction of its production and consumption in coming 2019-2024. At the same time, we classify different Mobile Phone Connector based on their definitions. Upstream raw materials, equipment and downstream consumers analysis is also carried out. What is more, the Mobile Phone Connector industry development trends and marketing channels are analyzed.